April 10th. Chapter 3 | Barcelona | Peter M. Schloss | J.D. - Mediator. We have considered that this journey unfolds in distinct “chapters”. Puerto Rico was first, the Atlantic crossing second and now Barcelona. It should have come as no surprise that the excellence of the Viking Cruise staff would extend to marshaling the timely departure of 900 passengers and their luggage. No chaos, not even organized chaos, just organized. We were off the vessel at 9am, our suitcase in the hands of the shipping agent to the USA, and in a taxi to our B&B within 15 minutes. 20 minutes later we were being given a tour of our room and facilities at Barcelona B&B. This is a wonderfully quaint place brimming with Old World charm. Our hosts, Telma and Kiku who is recently back from walking the Camino, graciously gave us early access to our room and a quick rundown of recommended sites and dining. 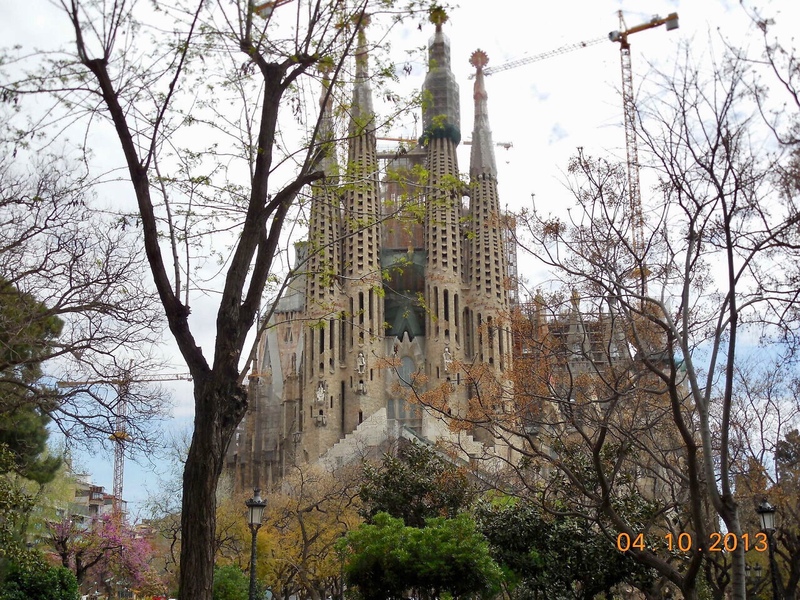 After we settled in we walked a few blocks to the Sagrada Familia. We have been curious to see what construction progress has been made since 2013. The first of the next pictures is from 2013, the rest from today. The optimists believe it will be completed in 2025. I won’t be holding my breath… construction began over 135 years ago in 1882! We spent a good hour walking the perimeter and marveling at this unconventional Basilica. Tomorrow we are scheduled to tour the interior and ascend one of the completed towers. We then walked to and down Las Ramblas, a pedestrian parkway and major shopping/tourist venue. This was the site of a tragic act of terrorism in August 2017 where a van ploughing through people, killing 13 and injuring 130 others. There is an obvious police presence today that may be in reaction to the August incident or because of the political unrest over the Catalonia secessionist movement. Our afternoon wandering took us to the Cathedral where we were surprised to meet Mart and Jean, Canadian friends from our Atlantic passage. One shortcoming of the efficient discharge of passengers this morning was the lack of opportunity to say proper goodbyes to the friends we had made during the crossing. We hope to reconnect with a number of these good folk in the future, but for today we are grateful for the chance meeting that allowed is to share a cafe and reflections on the journey with our Canadian friends. BTW, the cafe served Pabst Blue Ribbon Beer as one of its honored import beverages. I like Pabst but I’m sticking with Estrella Damm. After a proper and heartfelt farewell to Mart and Jean we attended a late Mass at the Cathedral and adjourned to one of Telma’s recommended restaurants for dinner. The evening meal in Spain is enjoyed much later than in the States. The restaurant was filled to capacity with no end in sight at 9pm. Our meal was excellent and reasonably priced. It consisted of a huge salad of fresh vegetables, cheeses, and cold meats. The main courses were sausage and beans, roast chicken with sides, and sliced baguette drizzled with olive oil and spices. Beer, wine, and the local version of Limoncello completed the feast, leaving our billfolds only 35 euros lighter (about $42.00)… not bad for the center of the second largest city in Spain. The city is Grand–the Bascilica is absolutely beautiful. I can’t imagine the years and labor that has gone into its structure–skilled hands and workmanship and dedication—all in God’s name! !